Why Get A Custom Canopy? We know how hard it is to start a business and not end up a statistic. That’s why we’re offering what they won’t, a special low price for you entrepreneurs to get started with a custom branded tent from Kittrich Canopy! Reserve your low price today by filling out the short form. One of our custom branding specialists will reach out within 24 hours to answer any initial questions to make your custom tent experience hassle-free. The majority of marketers (63%) plan on investing more in live events in the future both in budget and number of events. 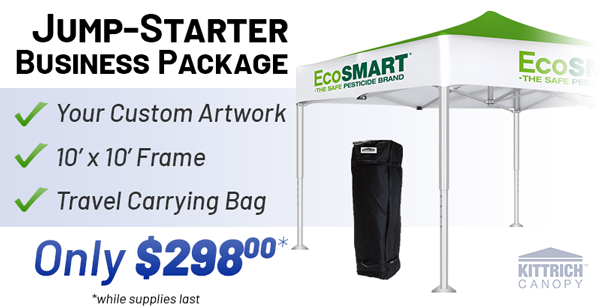 Let us make your custom tent experience hassle-free, cost-effective and high-quality to jump-start your brand on the road to success! Using cookies will help save your settings and will give you a better website experience.